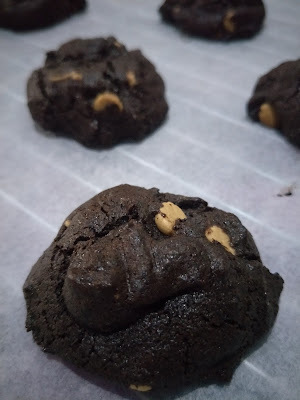 Well, I do notice that I've been doing lots of baking recipe posts these days. But these buckwheat cookies shan't wait because my 3/4 full pack of wholegrain buckwheat flour is waiting to go bad if I don't do something about it soon enough. Wanted to try some buckwheat bread and decided that I didn't like the flavour it gives my bread, so some chocolate cookies it shall be! First, melt your dark chocolates over a double boiler and leave to a side to cool. Cream your butter and sugar (it won't cream very well because of the ratio, just make sure it's well combined) before beating in the egg. Make sure your melted chocolate is cool enough before adding it into the egg mixture, and then mix in the vanilla extract. Sift in your dry ingredients and mix until almost fully combined before mixing in your peanut butter chips until just combined. To get thicker cookies, chill your dough in the fridge for about 30 minutes before dropping tablespoonful of dough onto your baking sheet. Space them about 1.5 to 2 inches apart as they do spread a bit. If you'll prefer a thinner and bigger cookie, skip the chilling part. But do space them further apart as they will spread a lot more. Bake at 180 degree Celsius for about 9 to 11 minutes (depending on your oven). These cookies are slightly crisp on the outside, and crumbly/cakey on the inside. 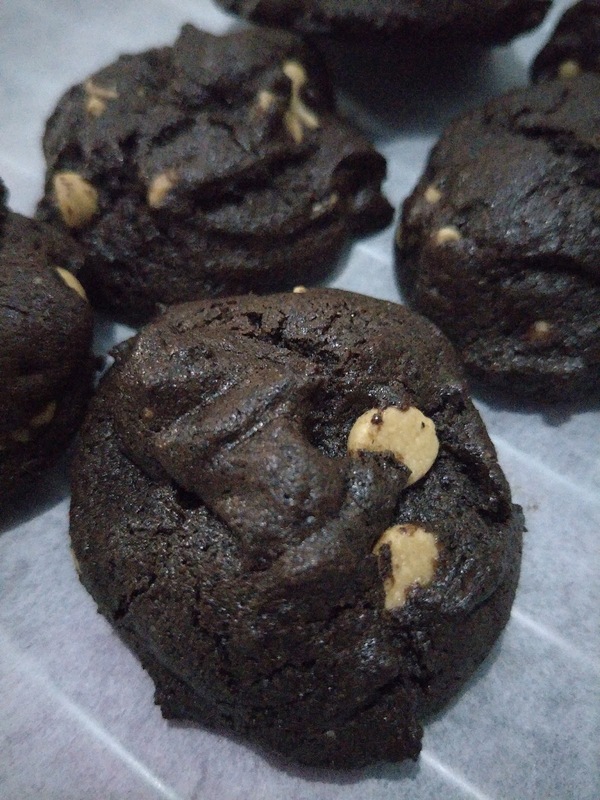 The "double chocolate" flavour (cocoa powder and melted chocolate) has successfully masked the distinctive buckwheat flavour while not making the cookies overly sweet. Best of all, they're wholegrain, albeit NOT a low calorie food. REcently i started baking oatmeal cookies. I like your recipe. I think it ia aomething i could use aome time. Seems very tasty too!